If you have been wondering how to fill your home with the wonderful smell of roasted garlic, read on. 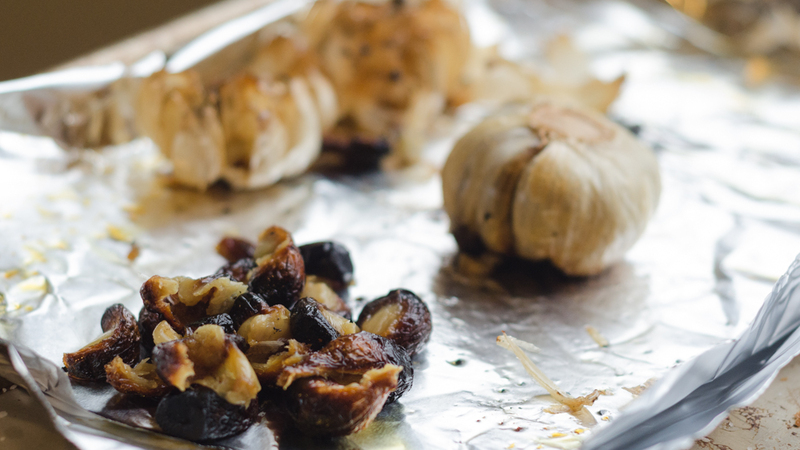 This is a simple way to make roasted garlic in the oven and come away with a batch of garlic infused olive oil as well. It’s a great building block recipe that you can use over and over in many other dishes. Roasting garlic is usually something I do whenever I’m going to have the outdoor grill going for at least an hour. In that case, I’ll wrap a large bulb in some heavy duty foil with a tablespoon of butter and stick it in the corner of the grill. After a good hour in the heat and smoke, you’ll have some tasty garlic butter….which is great on grilled corn-on-the-cob. However, in the dead of winter, I’m not doing that much outdoor grilling. The roasted garlic itself can be mixed with butter and make a simple, delicious spread for butter. I also wound up using a spoonful with some polenta and another dollop in a pan with butter to crisp up some roated parsnip gnocchi. Then there’s the oil. The confit element of this dish comes from submerging and simmering the garlic in olive oil. This obviously leave you with a very tasty garlic-infused oil. I knew was making a green bean and mozzarella salad later in the day that would have a balsamic vinaigrette and roma tomatoes, so I tossed a handful of the chopped tomatoes in the oil and let them simmer away as well. Later, I used some of the cooled oil to make the vinaigrette. It will take about an hour and a half end-to-end, but most of that time is unattended cooking. 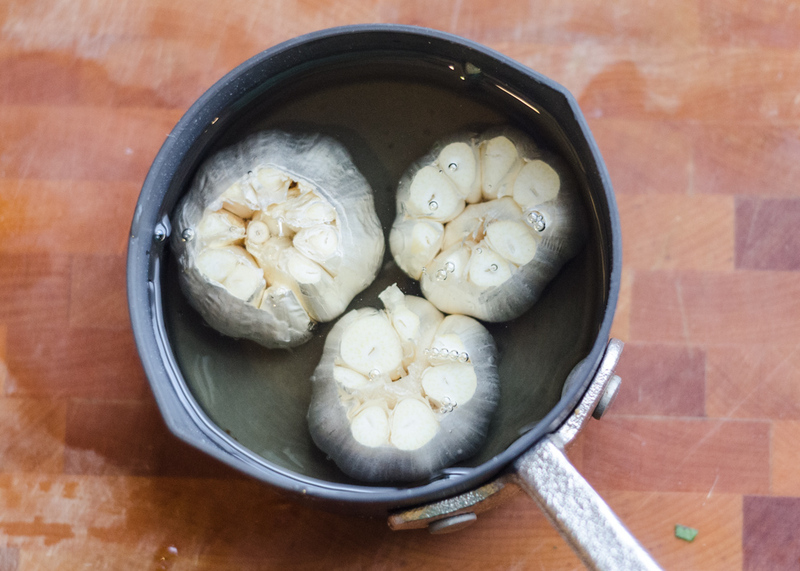 After the bulbs cool, you can either give them a squeeze or use a spoon to extract the cloves. What a great idea. I am going to do this! Thanks, Ginny…Hope it turns out great! This is one of my FAVORITE appetizers at restaurants. Roasted garlic served with crackers or a baguette. Simple yet deliciously complex. I'm so glad I have a recipe to make this at home! Thanks Becky…you couldn't have said it better about being simple, but complex!